Two weeks ago in midtown Manhattan, time stood still  literally. 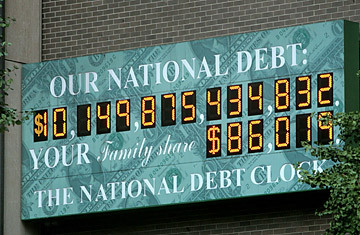 After the country's debt surpassed $10 trillion, the marquee-sized debt clock in Times Square, which has kept a running tally of the U.S. national debt for nearly 20 years, ran out of digits. For a nation already struggling with a bleak economic reality, it was a less-than-reassuring display. Several news organizations quipped about such a literal "sign of the times," while the satiricial newspaper The Onion offered its own brand of gallows humor: "If everyone just donated one dollar, we would have enough money to buy a new clock." Luckily, citizens won't have to pitch in. New York real estate firm The Durst Organization, which owns and operates the clock, plans to install an updated model sometime next year that can display a quadrillion dollars. In the meantime, the company has hacked the current display to provide a temporary solution  replacing the dollar sign at the front of the number with an extra digit. The late real-estate mogul Seymour Durst first erected the clock on Feb. 20, 1989 to call attention to the consequences of Reaganomics. At the time, the country had a national debt of $2.7 trillion. The original 25-foot-wide, 1,500-pound, 306-bulb sign cost more than $120,000 to create and install. (It now costs more than $500 a month to operate and maintain the light bulbs). Durst told reporters he had no plans to ever remove the clock. "It'll be up as long as the debt or the city lasts," he said, adding, "If it bothers people, then it's working." A tireless and outspoken critic of government waste and intervention, Durst routinely purchased space on the front page of the New York Times to run what he liked to call "bottom lines"  rants that ran along the bottom of the page like stock tickers. His haiku-esque May 26, 1991 message: "Federal debt soaring, national economy shrinking, soon the twain shall meet." In 1980, before technology could support a debt clock, he mailed handwritten holiday cards to dozens of congressmen that read: "Happy New Year. Your share of the national debt is $35,000." When technology finally caught up with his vision of a fiscal odometer, Durst's clock included a smaller counter that tracked each American family's share, which in 1989 added up to $49,466. At last count, the figure stands at more than $86,000. This is not the first time the clock has experienced technical difficulties. In 1991, Durst had to remove and revamp the clock so it could keep pace with the national debt's $13,000-per-second increase. ("Interest payments on the national debt are becoming the largest federal expenditure," he noted at the time). Before his death in 1995, the amount began accumulating so fast that the last seven digits became totally illegible. At one point, the surge actually crashed the computer that calculates the billboard's numbers. On September 7, 2000, Durst's son, Douglas, who now serves as the company's president, hung a red, white and blue curtain over the sign. The ceremony not only marked what would have been his father's 87th birthday, but also an historic moment in U.S. history  the national debt was shrinking. Because the clock wasn't built to count backwards, Durst pulled the plug. Just two years later, following the burst of the dot-com bubble and the economic fall-out of 9/11, he turned it back on. The billboard has ticked forward ever since. Over the past 20 years the digital "alarm" clock has been moved four times to make way for bulldozers and wrecking crews. Today, it hangs near the entrance of the city's IRS office. Said the younger Durst in an interview with TIME,"We thought it was a fitting location."